Light is one of the strongest source and energy but that has to be channelized to get the best out of it. This light can also be shine available outside or inner glow that radiates your personality. Although Citizen has staked out a new position as the leader in timekeeping with its Eco-Drives watches that run on any light available outside. With models ranging from dress models to sports models to professional dive watches, Citizen Eco-Drive runs continuously in any kind of natural or artificial light for a lifetime of use. Fueled by light, it never needs a battery. 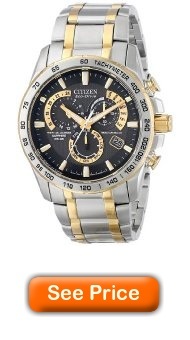 And all of that can be seen in this Citizen AT4004-52E “Perpetual Chrono A-T” Men’s Watch! This timepiece has Japanese Quartz movement with Eco-Drive, which charges in natural or indoor light. You can swear by its quality and style which is of top quality. This extremely accurate electronic movement developed in Japan utilizes the natural frequency of vibrations of a quartz crystal to regulate the operation of the timepiece. Golden and silver combination is very difficult to see but when done in right manner, looks ultra cool. Silver color sets a base for watch as the body is in silver color but black colored dial is beautified with golden detailing on sub dials and hands. This Citizen timepiece features one-second chronograph measuring up to 60 minutes, perpetual calendar, 12- and 24-hour times, alarm, power reserve indicator, luminosity, day and date function, synchronized time available in five time zones. Protective non-reflective sapphire crystal dial window completes the watch. Sapphire crystal is the second strongest mineral on earth, after diamond. Sapphire crystal is synthetic, scratch proof, is more resistant to breakage than mineral and there’s no angle distortion. The golden detailing doesn’t end only on the dial or chain, but fills the crown as well. Date column is given at 4’o clock position which is once again bordered with golden line. Jewellery bracelet is hardly required if you are going out on a dinner or party while wearing this one. As mentioned earlier amalgamation of silver and golden color is bold and quite difficult to look good. But citizen has worked hard on it to make it look super chic. Five chain pattern is utilized for golden detailing. Citizen Watch Company of America, warrants this watch (except the power cell, case and its components, bracelet and its components (including clasp, links, pins, screws), strap and its components or any accessories) to be free of defects in material and workmanship and to meet the timekeeping accuracy specification in the instructions for a period of 5 years from the date of the original retail purchase. Citizen ensures that you own it with pride and use it with precision.